This Palace Will Turn Your Pre-wedding Into A Fairy-Tale! Almost every little girl’s vision of her dream wedding comes from fairy tales, and this couple’s pre-wedding shoot proves that fairytales do come true! Destiny brought together Nabila and Mustakeen through their parents and just like in a fairytale, they instantly fell in love with each other. Every love story deserves to be captured with beautiful, dreamy and romantic pictures, and what could be more magical than a pre-wedding at a palace? Of course with the right clothes, location, lighting, a prince charming and a brilliant photographer, Nabila’s vision was turned into reality. 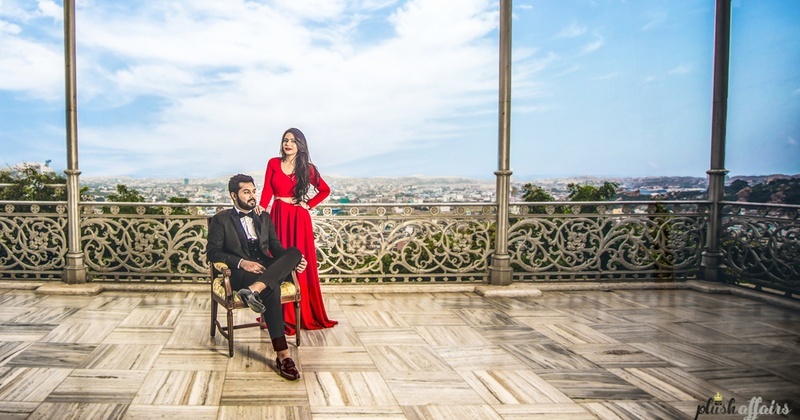 “We’ve always loved the Taj Falaknuma Palace property but the photoshoot was a spontaneous plan. We got in touch with the hotel officials to fulfill all the pre-wedding shoot requirements and also stayed at the property for two days! The hotel is amazing and has such a royal feel. When we weren’t shooting, we spent all our time exploring the property, dining there and having a good time!" On the groom - Radisson D'être by Govinda Mehta. On the bride - Self-curated intricately by the bride.